Natural light in labs, classrooms, hospital rooms, offices and other spaces increases collaboration and productivity and improves learning and healing. 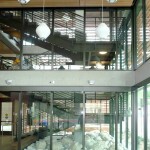 Increasing the use of glass can also yield stunning design results. The challenge is selecting the correct glazing and framing that provide appropriate fire, hazard and impact safety and meet codes. 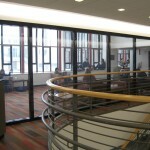 Advances in fire-rated glazing have delivered new tools to designers working to maximize the amount of daylight reaching deep inside a building, while fortifying its entrances, stairways, exterior and exits. 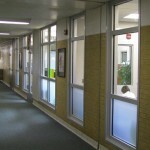 Forty years ago, traditional wired glass was the only fire rated glazing available. Today, there is a wide array of fire rated glass and framing products that can be used instead of opaque walls and doors. With all the new choices comes the opportunity for confusion and mistakes about which glazing, framing and assemblies should be used to meet codes and provide maximum safety benefits. This website both provides guidance about codes and specifications and inspiration for designers to increase the correct use of floor-to-ceiling, wall-to-wall glazing assemblies, large vision panels, sidelites and transoms and other interior and exterior uses of glazing.